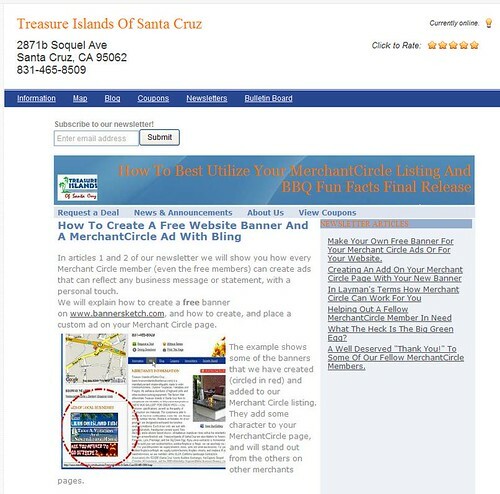 I got an emailed newsletter today from one of the merchants that's in my network for my production company: Treasure Islands of Santa Cruz. It's one of the best, most informative newsletters I've come across. 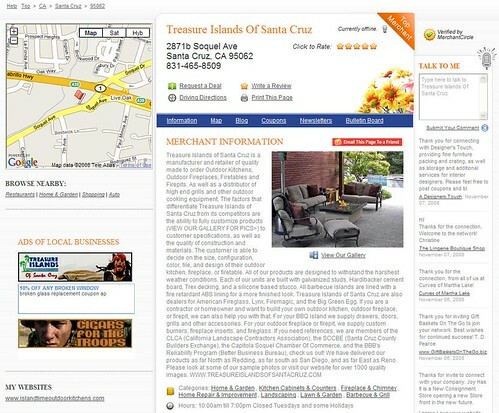 I've spoken to Rick Cook, the owner, before and he says that he often fields calls from merchants asking him how he did certain things on his MerchantCircle page. Well, I guess he finally decided to put it all down in a newsletter! Check it out by clicking here. Thanks Rick, for making my job a lot easier! Follow some of his tips, which increased his website traffic by 500%. Check out his MerchantCircle listing here.